In an event rich with inspiration and tradition, Holland America Line (HAL) held a dedication ceremony for Nieuw Statendam Feb. 2 at Port Everglades in Fort Lauderdale. 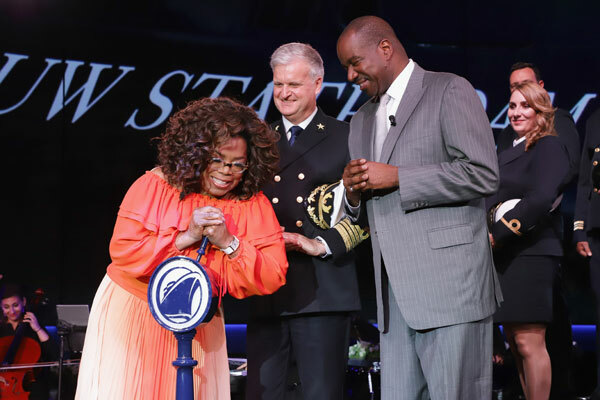 Godmother Oprah Winfrey – philanthropist, film star, TV icon, founder and editorial director of O, The Oprah Magazine – officially named the ship in a ceremony on board in the ship’s World Stage. Following the ceremony, a Gala Dinner was held on board. During the evening celebration, guests were invited to participate in a maritime tradition of pouring Champagne over the ship’s bell as a blessing.